Thursday, May 2, 2019, 4 p.m. - 7 p.m.
Saturday, May 4, 2019, 9 a.m. - 12 p.m.
CORTRAN + STAR service will be available for both meetings. 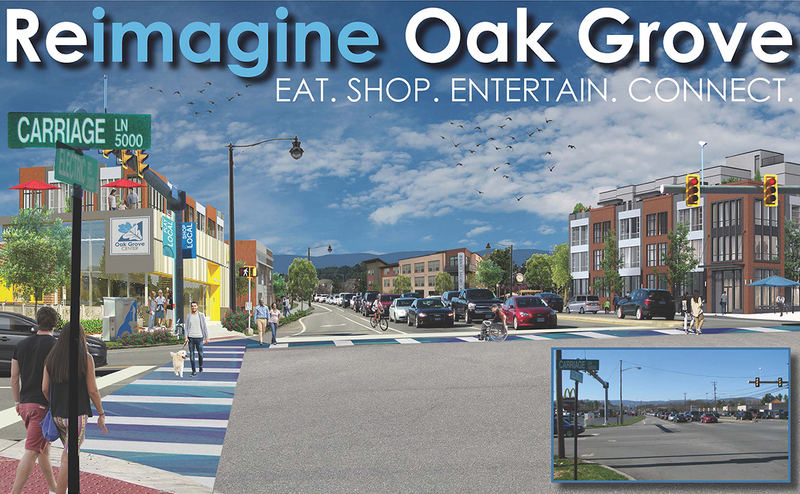 We’ve been talking about how Oak Grove could become a new destination to: EAT. SHOP. ENTERTAIN. CONNECT. We wrapped up four spring meetings in March and May, involving nearly 170 members of the public. More information about the plan organized into a two-page fact sheet. Survey results were revealed at the design open house meetings in May. The survey was open from February 1 through April 7 and received 595 responses. View photos from the community meetings. View the 30 second Public Service Announcement produced by RVTV-3 on YouTube.